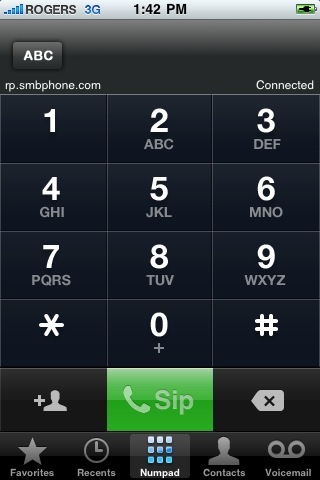 VoIP over 3G now officially allowed on iPhone & iPad, confirmed. UPDATE: It’s looking good folks! 3.3. 23 Because some mobile network operators may prohibit or restrict the use of Voice over Internet Protocol (VoIP) functionality over their network, such as the use of VoIP telephony over a cellular network, and may also impose additional fees, or other charges in connection with VoIP, You agree to inform end-users, prior to purchase, to check the terms of agreement with their operator, for example, by providing such notice in the marketing text that You provide accompanying Your Application on the App Store. 9. Third Party Terms of Agreement: You must state in the EULA that the end-user must comply with applicable third party terms of agreement when using Your Application, e.g., if You have a VoIP application, then the end-user must not be in violation of their wireless data service agreement when using Your Application. Now that we know VoIP over the cellular data network is allowed, and ATT has said they will support it, and ATT has a cheap unlimited data plan (Listen up Rogers, Telus, Bell! ), the iPad and iPhone has just become something I think we should be excited about. Apparently the new iPhone dev agreement has officially been modified allowing for VoIP over the cellular data networks. Trying to confirm that myself. If this is the case, the iPad and iPhone just got a whole lot more interesting. Will Rogers follow AT&T's lead and allow VoIP over 3G? Yes. 1. Rogers has cornered the GSM market in Canada and is the only carrier to offer the iPhone, but that is about to change. Telus and Bell have tag-teamed to erect an HSPA+ network and will be offering the iPhone as early as next month. Just in time for the holiday season and with plenty of time to ready themselves for the 2010 games in Vancouver. It’s true that 3G is not yet ubiquitous which mean VoIP over 3G is not something that will drive massive adoption in the near term, but it will be enough of a detractor for a good percentage of the users to not choose Rogers if Telus and Bell allow VoIP over 3G on the iPhone. 2. Rumors have it that Globalive / Wind Mobile is hot on trail of Rogers and will be completing Phase 1 of their network build-out as early as this spring. They too might be carrying the iPhone. None of the big three want to get beat out by the new guy on the block. 3. Other devices on the Rogers network already have apps that deliver VoIP over 3G service. It’s not the network that is the limiting factor here, it’s the Apple app store and the contract they have with the carriers representing the iPhone. 4. Net Neutrality. I am sure that Rogers would like to avoid getting dragged into the same kind of kerfuffle the FCC has been crowing about in the US. The Internet does not stop at the desktop, so why should those it be left out of such conversations, it simply shouldn’t. It’s should also be clear that Apple would prefer it if the carriers would allow VoIP over 3G. It would mean more devices sold and more interesting apps in the app store. I just can;t see Apple saying “no thanks” to VoIP related (product and service) revenue in the app store. I think the question is more a matter of ‘when’ as opposed to ‘if’. Hopefully it’s soon! I will admit, this is a bit of a silly comparison but the truth is that I have had a few customers (and some analysts) asking for some clarification on the new Google Voice offer and how it may compete with Response Point when coupled with an ITSP. The fact is they really do not compete in any measurable way and they could easily compliment each other. The obvious major difference is that Response Point is a small business phone system, Google Voice is really a service offering targeted at individuals. When we combine Response Point with an ITSP (Internet Telephony Service Provider) we start seeing some similarities in the services between the two offers but they are really meant for 2 distinctly different purposes. Response Point offers an actual premise-based system with a base unit, handsets and features like; auto-receptionist, DID integration, hunt groups, voice mail to email integration etc. All of the things one would expect when purchasing a small business phone system. Google Voice service is an overlay service on whatever you have today, so if your existing phone system is simply not cutting it, it’s unlikely that Google Voice is going to be able to transform it into the system of your dreams. It’s true that Google Voice will allow you to take advantage of certain features but don’t expect to find a Park, Hold or Transfer or anything fancy like speech recognition. Google Voice is an inbound-centric service. Most features can only be used with an inbound call, that includes call recording and call joining. One could use the Google Voice – simulring feature to call your Response Point phone number and at the same time it could call your mobile. Google Voice – call recording is a handy feature that is currently not a feature offered in the Response Point system. Google Voice – voice mail transcriptions is a handy way to receive visual voice mails via email and SMS. Google Voice – call widgets allow users to put callback widgets on a website. This will allow the visitor to put in their phone number and the system will call them and then it will call your Google Voice number. Google Voice – SMS is a cool way to compose, accept and manage text messages while maintaining control over the devices associated with that service. The Google Voice service is only available in the US. Even US subscribers can only forward/simring their Google Voice numbers to other US numbers but that is likely to change to include international countries in the near future. In theory, the Google Voice call should go wherever the media is sent. Call Routing results may vary depending on the Response Point ITSP you choose. When calling out, your existing phone number (Caller ID) will be presented to the callee unless you use the dial-out feature, which is (IMHO) a bit of a hassle. This causes some problems as most of us are used to calling people back on the number we last saw from them. Fortunately, many ITSPs (unlike the conventional phone companies) will allow you to change your Caller ID number to match your Google Voice number. Google Voice does not address LNP (Local Number Portability) at all right now. Which means you can not bring your existing numbers to Google Voice, you have to choose a new number. For those at IT Expo, this free session is about to begin in Room 109. SMB Phone is a unique VAR and ITSP. Come learn how they identified Response Point as a key technical and business component in their nation-wide go to market programs focused on SMBs. Response Point and SMB Digital Voice enable reliable communications for small businesses in Canada. SMB Phone Inc., a new Canadian telecom carrier created exclusively for Microsoft Response Point services announces, simpler, smarter and easier phone service for Canadian small business, in partnership with Microsoft. The Microsoft and SMB Phone marketing alliance heralds a new era of affordable, feature rich, easy-to-manage, easy-to-use business communications integrating voice recognition, email, computer and mobile services for small medium business in Canada. Canadian small medium businesses now have affordable, easy, online access to a new generation of business communication features and services with Microsoft Response Point and SMB Phone. – Direct Dial numbers for employees, departments, projects etc.